If you buy into that logic, you also buy into the proposal that we can prevent death by controlling knives ... not just some deaths, but all deaths. The secret to eternal life is to stop people from owning knives. Make sense? Didn't think so. The dots don't quite connect. In the email below, we see Hale distribute a toxics report from Ecology that she believes justifies and supports her position on the CAOs. She thinks it connects dots. It doesn't. Even if the dots did connect, the report wouldn't support the need for greater land use controls so much as greater pollutant source controls. Hale has often dismissed the idea of pollutant source control as being impractical, and she continually wants to "solve" environmental problems with land use controls only. However, the whole point of the Ecology toxics report was to justify state programs for controlling pollutant sources through product reformulation. It was used for exactly the activity Hale dismisses, which also would obviate the need for land use controls as a solution for the same "problem" at the local level (assuming there was such a problem here in the first place). Using land use controls to solve environmental problems without any regard to source control (or source identification) is bad policy and bad science. It would be like giving a person an antidote without checking to see what poisoned them in the first place, or without investigating whether the poisoning was ongoing. Even if Hale and the County don't want to engage in source control, the State does it anyway. Every year, the State passes new laws, and the regulatory agencies write and revise their regulations, including new rules about toxics. Our runoff will become "cleaner" regardless of what our County does. Despite that, it doesn't stop Hale from wanting to be stricter at the local level too. San Juan County ... so many solutions, so few problems. Attached is a summary of a recently released report on toxic compounds associated with stormwater runoff. I think this just confirms our general understanding of the problems that result when people change the landscape and introduce building materials and chemicals that end up in runoff. The original email contained an attachment which can be downloaded here. Surprise, surprise, it was produced by Herrera, one of the consulting regulars who also is a consultant to San Juan County. Shireene Hale has been the point person for keeping the CAO moving. As the previous post described, she's played a vital life-saving and life-supporting role for Dr. Adamus' credibility. A full description of Hale's destructive influence on the CAO process would be a tome. She's facilitated wrong turns. She's contributed false science herself, dismissed the experiences and scientific advice of qualified citizens, ignored warnings, falsely accused dissenters of crimes, played the victim, given priority to the concerns and comments of eco-extremists, and insinuated that anyone who disagrees with her is following a personal agenda. Rather than write a long diatribe about Hale, we'll describe one recent moment that captures how she's handled the entire CAO process. At the Council meeting on September 21, Councilman Rich Peterson proposed the idea of local monitoring. Lovel Pratt opposed the idea and asked Hale if there were any GMA provisions that required the County to produce local science. In response, Hale said, "No, there is a lot of information from national and international sources about the effects of development," and she said that we can use that data in place of local data. WAC 365-195-905(2) Counties and cities may use information that local, state or federal natural resource agencies have determined represents the best available science consistent with criteria set out in WAC 365-195-900 through 365-195-925. The department will make available a list of resources that state agencies have identified as meeting the criteria for best available science pursuant to this chapter. Such information should be reviewed for local applicability. No such review has been completed for us, and Hale regularly ignores or misconstrues the remaining provisions of WAC 365-195 "Growth Management Act - Best Available Science." Hale would like us to believe that evidence from "somewhere else" is the same as evidence from here. Hale would like us to believe that evidence from "somewhere else" requires no validation of local relevance performed by qualified experts in pertinent fields, but that is incorrect. Taking information from "somewhere else" without proper evaluation is not a valid scientific process, and is a violation of WAC 365-195. Moreover, it's just plain foolish. The danger of over-generalization is illustrated by an aphorism from medicine which says, "When you hear hoofbeats behind you, you don't expect to see zebras." However, Hale doesn't believe in zebras, and her preconceived beliefs about development "everywhere else" mean that we're lumped in with the rest of the herd. Is there anyone in the Pacific Northwest who doesn't know about the controversial final play in the Seattle Seahawk's victory on Monday Night Football? They certainly know about it Green Bay, where anger has given way to mockery (see replacement weatherguy video below). It brings to mind comparisons of our "CAO science" to real science. Like replacement NFL referees, the Council's CAO science just doesn't cut it. It's replacement science all the way. It's not real eco-toxicology. It's not real conservation biology. It's not real fate and transport. It's not real hydrology. It's not real oceanography. It's not real environmental science. It's not real anything, except real you-know-what. It certainly appears that some, if not most, of the key CAO methodologies have been dreamt up by Planner Shireene Hale and just sort of laundered through the eco-suggestible Dr. Adamus to come out as Best Available Science (BAS) on the other end. The wants and desires of Ecology and the Friends have been tossed into that sausage maker too. Last December/January, for example, Hale resuscitated wetland buffer efforts after Adamus' initial buffer proposal died. Hale came to the rescue and cobbled together bits and pieces of inapplicable stormwater hydrology (her husband is the Stormwater Utility Manager for the County) to create the "site-specific" water-quality buffer method we now have. After flushing (pun intended) out the initial details, Hale handed it off to Dr. Adamus, so he could take credit for it. However, even now when the Council has questions about key aspects of the methodology, such as the Mayer paper, Hale answers those questions, not Adamus. All during the near-death experiences of Adamus' credibility over the past year, the CAO Implementation Committee was convening, and we continue to see the individuals of that group act as ongoing life support for Dr. Adamus' ideas, no matter how ridiculous. The CAO Committee members included Patty Miller, Lovel Pratt, Richard Fralick, Shireene Hale, Jon Cain, Pete Rose, and Colin Maycock. Committee meetings were not public, despite having three participating Council members (enough to veto Council actions). "They" say that nothing really went on in those meetings except discussions about scheduling. Then why exclude the public? It seems suspicious that some of the actions of the Committee members appear coordinated, such as when Dr. Adamus recently attended a Council meeting via phone conference. During that meeting, Rich Peterson asked Adamus a challenging question. Adamus prevaricated, hemmed and hawed. Lovel Pratt came to the rescue by interjecting a shiny-object question for apparent distraction purposes, and Hale directed the conversation towards Pratt's shiny object, never to return to the query of Peterson. If experience is any guide, Adamus probably needs the help. Dr. Adamus has bombed in front of the Council and Planning Commission on a regular basis. Yet, he lives on. Like Lazarus, Adamus rises from the dead with the help of his miracle-working Life-Support Committee. If the CAOs are to have a prayer, the Council needs Adamus, and in a strange turn of events, the life-givers appear to be held hostage by him at this point. During recent public meetings, Council members almost seemed to be begging with Adamus to be reasonable, as his "science" recommendations were becoming more and more extreme. We heard Council members ask, "Dr. Adamus could you accept" or "Dr. Adamus, do we really need" ... but having ridden Dr. Adamus this far, they are in no position to bargain with the monster they've created. If Dr. Adamus says BAS requires all of us to abandon our homes to create a wild frog sanctuary, by golly, the Council is going to stand behind it as BAS. And when any of us try to get answers from our public officials for their apparently illogical support for replacement science, "they" respond much like Howie Rosenfeld recently responded to CSA (see email reply below copied to all candidates). But it is the positions and actions of Council members who prop up replacement science that deserve scrutiny, not the motivations of those who can't fathom it. Can you please explain why in God’s name would I want to participate? It sounds like I’m being invited to my own roasting. The contributors to my opponent and Lovel’s are a who’s who of CSA members. You yourself are listed as an assistant. What kind of Fair and Balanced format does CSA have in mind? My position on the CAO is already well known. CSA’s position is well known. What’s the point? The meeting is scheduled to start at 12:00 and continue until 2:00 Saturday afternoon. The countdown was temporarily interrupted because of posts associated with alleged wetland excavation/filling by our Council Chair, Patty Miller (see previous two posts and Flaw #48). It appears that she may have been confused about where "possible" wetlands lie on her property. How could she be so confused? Just because various maps conflict, the opinions of different experts conflict, and her personal experiences and historical uses of her property conflict with the current "possible" designations? Is that all? Under the new CAO, after she sorts all that out and "knows" where the wetland boundary is, all she has to do is apply the buffer. What could be easier? Looks like some of Miller's wetlands might be associated with streams. Just follow the simple steps in the proposed CAO. Here are a couple of steps excerpted from the Fish & Wildlife Habitat CAO. Step 3. Determine the width of the water quality-sensitivity buffer using the procedures in SJCC 18.30.150 (Wetlands) and Table 3.6 for 70% pollutant removal and either the normal development or the green development option). The water quality-sensitivity buffer extends landward horizontally from the bank full width of streams (as defined in WAC 222-16-010), and the OHWM for lakes, ponds, and marine shorelines. Step 7. Buffers, Tree Protection Zones, and Existing Development. Where structures or impervious areas, legally established prior to the effective date of these regulations, encroach into a required buffer or tree protection zone, the buffer or zone shall be modified to exclude the footprint of those structures and impervious areas. Buffers and tree protection zones shall not extend across public roads. For private roads, buffers and tree protection zones shall not extend across the road when the road design, flow of runoff, quantity of traffic, and/or gap in tree canopy result in an area that does not support functions and values of the FWHCA to be protected, as determined by a qualified professional. Structures, roads and impervious areas may be modified, replaced, relocated, or expanded within the development area existing on the effective date of these regulations, in conformance with the procedures and requirements of SJCC 18.30.110.G. And there are 53 pages that read just like that in only the Fish & Wildlife CAO alone ... full of more steps, flowcharts, definitions, and rules. It reads like the demented science-wannabe stream-of-consciousness ramblings of an OCD über-bureaucrat working for the nanny-state from hell. Environmental protection? I think not. Something else is going on, and it's very very wrong. It's a matter of time before every one of us gets wrapped up in the same eco-Gordian Knot. Miller's situation isn't so much about Schadenfreude; it isn't gloating; it isn't Vivien Burnett. But it should be a demonstration that all of us will get caught up in this mess, and I don't know why Miller or any other Council person supports the track we're on. Do I think Miller is killing the planet or doing any serious harm? No, she probably isn't. She might even escape the regulatory red-tape nightmare, but most of the rest of us won't. Of those of us that are caught, only a few will be able to afford the time and money to persevere through the red tape tangle. People will, and are, turning on one another, and the same people who talk longingly about civility are the ones undermining it with their support for unjust, punishing, eco-pointless laws. And our community way of life is paying the price. Patty Miller ... other Councillors who support this fiasco ... this is your life ... and legacy. In response to Councillor Miller's email (previous post), the Trojan Heron sent the following email to the Friends. We will keep you updated. Please see below. Do the Friends have any plans to file a complaint against Council Chair Miller's alleged activities in a wetland? Do you have any plans to visit the property or investigate the matter? Thank you for the opportunity to respond to the concern raised on your website. My property in Olga does have a number of wetlands. Over the years I have had buildings built and cleared a small portion of land. 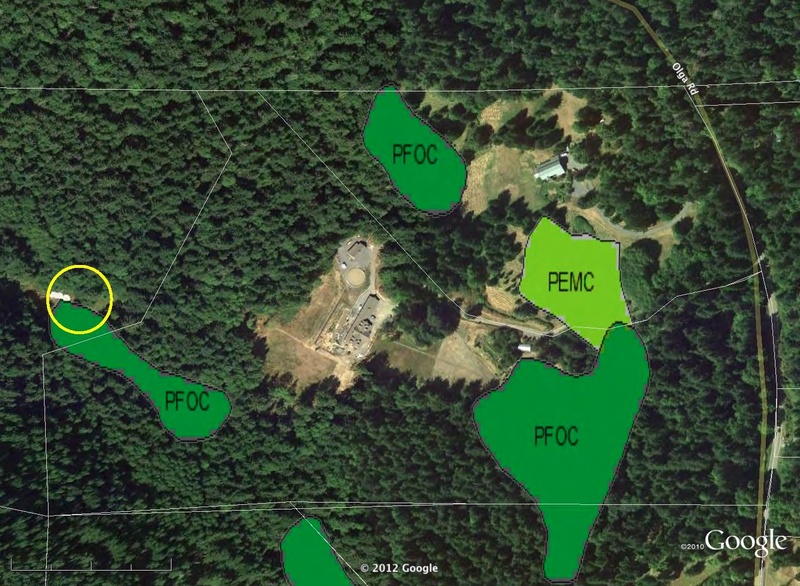 I have obtained the building, storm water, and forest practices permits required for these projects. Each of these projects have required wetlands assessments at varying levels and thus I have consulted with several wetland experts to learn more about the wetlands and to inform how I develop my property. Additionally I allowed the County to assess and inventory the Category II wetlands as part of the work to develop the possible wetlands map. I do not believe that I am doing any work in a regulated wetland or its buffer. The work that is being questioned is a small project in an area next to an old road/trail that we use to get to the back portion of the property and does not include any filling or bulldozing. I believe this work is well outside any buffer associated with these wetlands. If any citizen has a concern about my conduct I encourage them to file a complaint with the County's Community Development and Planning department. I have tried to learn and live by the laws developed in San Juan County and expect that I would be held accountable to them. We have a process that is intended to identify and resolve these issues. This is the most appropriate and constructive process to follow. The Trojan Heron received this reply from Patty Miller in response to the questions about the work on her property and wetlands (original post and comments can be found at this link). We don't know the County's position about this, and of course, if you remember the way the Charles Dalton story developed, his activities triggered a cascade of emails between the Friends, Ecology, and the County, resulting in several "visits" from those groups. Based on the information available to the Trojan Heron, and depending on which map is used, then the alleged work seems to have happened either in, or very close to, one or more suspected wetlands (see maps below). Wow ... if a County Councillor finds it this hard to follow the rules, imagine what all this conflicting information will mean to the rest of us. 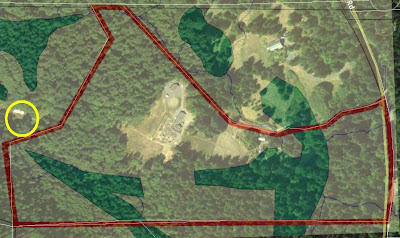 Miller's property with possible wetlands as shown by the County GIS map. 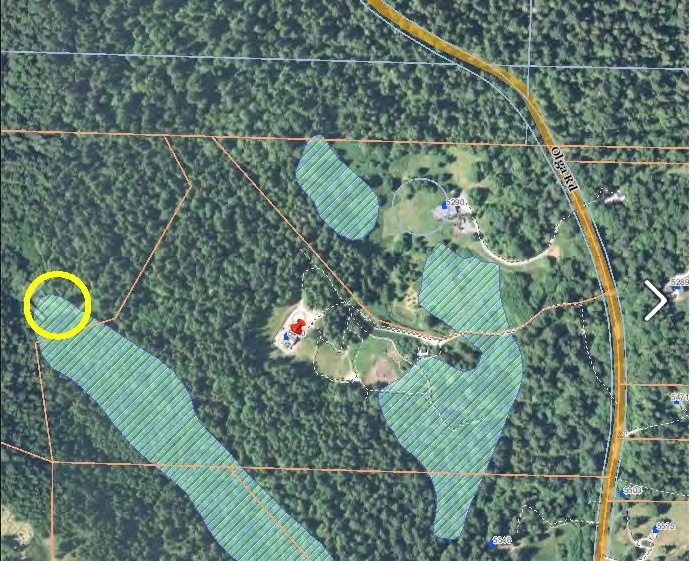 Yellow circle is the approximate location of where the work is believed to have occurred. US Fish & Wildlife Service National Wetland Inventory Map of Miler property. 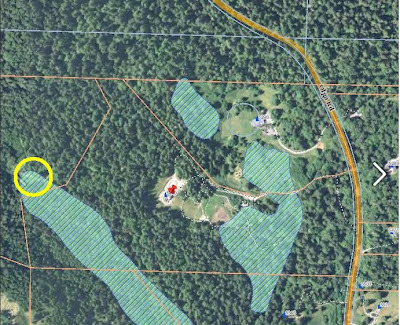 Yellow circle shows approximate location where work is believed to have occurred. Possible Wetlands Map associated with the current Wetland CAO proposal. Orange circle is the approximate location of where the work is believed to have occurred. Green areas are possible wetlands. Black lines are un-typed streams. 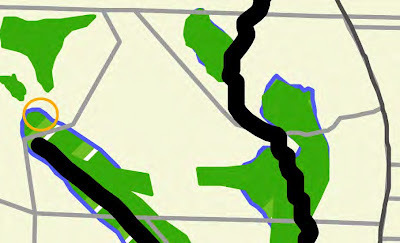 Miller's Property with possible wetlands (green) and streams (blue) as mapped by Adamus. Yellow circle on adjacent parcel (also owned by Miller) is the approximate location of where the work is believed to have occurred. A friend referred me to an article in The Atlantic about the problems in Washington, D.C. but the article could just as well be talking about San Juan County. It says the public sector has become a "deviant subculture." Rather than regurgitate the article, I'll leave you with this quote and urge you to read the original. It's a gem. America should move the national capital. It wouldn't matter where, as long as government is run by new people not infected by the current culture. But if we can't, the only way to change the culture is to put public employees on the spot. Where do our Friends go when they leave us? That's not an existential question, but one about networks and common tactics. We already know that Stephanie Buffum came from the hardball Center for Biological Diversity and is the former Mrs. Kieran Suckling, but what about some of the people who have left the Friends. Where are they now? Before Kyle Loring, the Legal Director of the Friends was Amy Trainer. She is now the Head of the Environmental Action Committee of West Marin (EACWM), where she's making life unbearable for some people in Northern California. Like the Friends, EACWM doesn't let facts get in the way of their efforts to destroy people, small business, and agriculture. Some people feel that Trainer/EACWM are testing strategies that will be deployed here in the very near future, so if we want to see where we are headed, have a look at OysterGate. It's about a small oyster farm in Point Reyes National Seashore. In 1962, Congressman Clem Miller wrote and introduced a bill for the establishment of Point Reyes National Seashore to protect a shoreline region from residential development. Miller's vision included the continuation of the historic ranching and oyster farming in the area along with the preservation of the grasslands and open scenic vistas. The mix of commercial and recreational uses was the reason the area was designated a National Seashore rather than a National Park. In 2010, all of the park's beaches were listed as the cleanest in the California. Regardless of Miller's intent or of the park's spectacular environmental health, Trainer/EACWM, in conjunction with corrupt government officials and bad science, have had it in for a small oyster farmer in the park. Trainer and EACWM's tactics have even been too extreme for the typically eco-friendly California Democratic Party, as Senator Diane Feinstein has sided with the oyster farmer. Doesn't matter, though. Trainer and EACWM keep pounding away. Have a look at the videos below (and the linked article here). Think of what is happening in Pt. Reyes when the Friends send out misleading emails saying, "Shouldn't we protect at least 9% of our shorelines?" The Friends never mention that our proposed CAOs will designate 100% of our shorelines as critical. The Friends never mention how much shoreline is already in parks or otherwise protected here (about 20%-25% of shoreline parcels are in a natural or conservation land use designation). Every move by the Friends and Gang Green is calculated to position us for the next move ... and then the next ... and the next. Thank you, Friends, may I have another? There will never be an end until we are all driven out, like the Drakes Bay Oyster Farm. NOTE: The video screenshot that was posted here from ABC News was causing scripting errors to some users, so it was taken down. However, you can still access the video by going to this link. To see the second video (OysterGate Scandal), just click on the image below. Confabulation is a memory disturbance that is characterized by verbal statements or actions that inaccurately describe history, background, and present situations. Confabulation is considered “honest lying,” but is distinct from lying because there is typically no intent to deceive and the individual is unaware that their information is false. Although patients can present blatantly false information (“fantastic confabulation”), confabulatory information can also be coherent, internally consistent, and relatively normal. Individuals who confabulate are generally very confident about their recollections, despite evidence contradicting its truthfulness. It is frequently associated with delusions of grandeur, and the CAO process has been dominated by an attitude that individuals and their opinions are worthless compared to bureaucratic ambitions. Every time we hear Adamus say, "According to Science" (and we hear it almost every time he speaks), we're hearing confabulation. What reasonable person with a healthy psyche presumes that his lone voice embodies "Science," especially when so many credible scientists disagree with him? What group of damn fool Councilors laps up such drivel? According to the WAC, Adamus' BAS synthesis should have been peer reviewed to be considered BAS itself. It was not. So much for the opinions of "Science." I believe it (and its author) would have been thoroughly discredited had it received a proper peer review, as even the modest review by Dr. Tim Verslycke (and others) suggests. And speaking of "peer review," we'd like to hear more about the widespread rumors, which have persisted for weeks now, concerning Council Chair Patty Miller's alleged wetland filling activities. According to several sources on Orcas, she has been filling in wetlands like mad in an effort to reduce her personal exposure to the harsh restrictions of the proposed CAOs, ahead of her vote on the matter. These alleged activities have occurred at the very same time she has been the Chair presiding over deliberations about wetland protections. That's the story, anyway. The Trojan Heron wrote to the County's new "fact-checker" website yesterday afternoon (see below) and directly to Council Chair Miller requesting comment, but we have yet to receive a response. Maybe she was busy. provid[ing] straightforward facts and information to correct errors and misperceptions that have appeared in widely circulated sources. We'd like to think the fact-checker people at the County could live up to their mission statement (assuming they respond at some point), but based on the confabulation of the CAO process, the County hasn't been doing a very credible job of providing straightforward facts and information. For weeks, Orcas Island has been replete with persistent rumors that Patty Miller has been using rented and purchased excavators to fill in wetlands on her property in advance of the CAOs taking effect. Several reliable sources allege that this has been occurring throughout the time that Miller has led deliberations on the wetland CAO. Would the County or Councillor Miller like to respond to these reports? After watching the Council session yesterday, the conclusion that many have drawn is that our Council just doesn't get it. At one point yesterday, Council Chair Miller even admitted that BAS was nothing more than "group-think," but it's clear they are going to follow it anyway ... even though they don't really even know what that means. They rely on Dr. Adamus to tell them. The Council voted numerous times yesterday to simply roll over and agree to virtually everything Dr. Adamus said. Fralick, Pratt, and Miller were particularly active in driving the out-of-control CAO bus, with Rich Peterson offering periodic objections that were ignored. As usual, Rosenfeld and Stephens were just along for the ride offered by Fralick, Pratt, and Miller. At this point, the Council has come to identify so heavily with Dr. Adamus' scientific prowess that they believe "Adamus=BAS." Adamus begins every sentence with "According to Science," and I get the impression that Adamus could say, "According to Science, thou shalt not suffer a witch to live" and the Council would believe it were BAS. Yesterday confirmed for many that we have extremists for Council members serving as acolytes for a charlatan "scientist" propped up by the lunatic fringe of Ecology. The Council never considers or makes reference to any comments or views except those expressed by Shireene Hale, Adamus, and on the margins, Deputy Prosecutor Cain. Cain has reduced his role to sitting next to Shireene Hale and acting like a pull-string doll, repeatedly saying that if the Council departs from "science" they will have to explain why. The Council interprets this to mean that they either follow whatever Adamus says or else explain themselves, which they are loathe to do. The entire show is a sycophantic corruption of process and science that has become the standard MO for this confederacy of dunces running our County. The Planning Commission is largely ignored, community groups like the Common Sense Alliance are totally ignored, and the overwhelming outpouring of individual citizen comments are ignored. I would think that even a modicum of respect for the public process would cause our Council to at least recognize that public input has been received; and to comment as to why it is not being considered. But no. If recognized at all (as in a previous meeting on August 28), the only stakeholder groups mentioned are the Friends, Futurewise, and Ecology. The rest of us don't exist. But I guess that's the real point. We don't exist. Tolerated for our legally-required 3-minutes of public testimony, they'd prefer that we all go away. Yesterday, the Common Sense Alliance sent out a press release with their view of the situation and a set of recommendations. It makes a heck of a lot more sense than the views of our Council. The Common Sense Alliance (CSA), a San Juan County-based community organization focused on environmental protection, community health, and economic vitality, yesterday submitted to the County Council its urgent recommendation that the County abandon its current proposed changes to our Critical Areas Ordinance (CAO), because the proposal is scientifically and legally indefensible, and that the County instead affirm our existing CAO regulatory scheme, improve its enforcement, and develop a professional data collection and monitoring program. The CSA recommendations constitute a sensible, compliant, and prudent way forward for our County, our environment, our economy, and our people. We recognize the success of the substantial public and private efforts by our citizens to protect our ecosystem. We acknowledge the significant testimony and factual evidence of our environment's health, while accepting that areas of uncertainty remain which may be clarified over time by monitoring of appropriate scale and quality. The question that came to the minds of most of us as this process unfolded is “What is the problem”? To date, we have seen no scientifically supportable answer. Indeed, a few weeks ago, an eminent federal scientist testified before Council that our fish and wildlife habitat was “spectacular,” and that she could not think of anything that we were doing wrong. CSA agrees. Oft-repeated alarmist claims that humans in San Juan County are directly responsible for material harm to salmonids and orcas have no creditable scientific underpinning, and the Council should recognize that those claims no more warrant extensive, expensive, and burdensome new CAO regulations than the Department of Ecology’s oft-repeated claim that the volume of toxics washing into Puget Sound from stormwater was equivalent to an Exxon Valdez oil spill every two years (recently retracted), or Ecology’s claims that fish kills in Hood Canal are the fault of humans (retracted just this week). CSA urges the Council instead to recognize that the current process is irredeemably tainted, the existing product is fatally flawed, and that it is time to move ahead to obtain the information we need for rational rules for the protection of our environment. We invite you to review our recommendations at this link, and to urge Council to pursue them. Of all the problems associated with the CAOs, one of the most difficult to overcome is bad data interpreted badly, and then jumping to conclusions about it. For a non-CAO illustration, look at what the Department of Ecology has had to do recently. Their fallibility has been demonstrated in rather high profile as they have been forced to backtrack from some of their most frequently repeated environmental alarmist claims of recent years. We saw this with Ecology's claims about stormwater where they said the equivalent of an Exxon Valdez oil spill washed into Puget Sound every two years. After three years of shouting from every mountaintop, they had to backtrack. As the previous post in this blog noted, Ecology just had to do this again after release of their new report on Hood Canal, where they had to reverse their frequently stated claim that humans were to blame for fish kills there. A more thorough review of the science concludes that such occurrences are due to a "cascade of natural events." The term I use for bad data interpreted badly is zombie data, and there is a lot of it around here. Zombie data is dead on arrival, but for some reason, it is able to wander around un-dead for years. And it usually ends up eating people and their property before meeting its ultimate demise. Unfortunately for us, there is a cottage industry of non-profits and quangos who generate hordes of this crazy stuff, usually funded by grants. Data collection is great, but it has to be done by people who know what they're doing, and then the collection methods and interpretations need impartial peer review. We should take the approach that all data and interpretations are suspect, not definitive, until/unless subjected to the highest standards of independent quality review (not consensus-building review, but authentic independent critique). Our Best Available Science (BAS) and BAS synthesis are so full of zombie data that we might as well call it zomBAS. This doesn't stop our Council members from believing it, however. They can't tell dead data from living data. Others can. Below are some excerpts of critiques of our zomBAS. Please re-read all these references again to make sure that the data actually support their conclusions. Most of them are unpublished in-house reports without peer review. From my reading, even “anecdotal” is a stretch for some of them. ... The documents of greatest concern are those produced by Kwiaht. I have worked with Russel in the field as well as read through those documents that I can get a copy of. Frankly, I’m NOT impressed with the methods, the data, the analyses, or the unfounded conclusions. His 2008 and 2010 “papers” are unpublished manuscripts, and both have these very serious flaws. I described them in my letter to the Council and would be willing to talk with you in more detail if you wish. Others in the same category include Brennan, Moulton, Wyllie-Echeverria (2008). ... I also have some concerns about oral presentations. Details of methods and analyses are often not part of a powerpoint presentation and thus the validity of the data cannot be assessed. These include Beamer, Canning, Whitman, Wyllie-Echeverria. ... And finally, it makes me more that a bit nervous to have “circular citations” --- BAS reports citing other BAS reports, such as Herrera, Adamus, and The Watershed Company all citing BAS reports by Herrera. The statement that "nitrogen is one of the most difficult contaminants to remove, and if buffers will adequately remove nitrogen it is likely to remove many other contaminants" (San Juan County Council, 2012a, p. 7) is a significant oversimplification of the current state-of-the-science of chemical fate and transport and buffer effects on water quality (e.g., as summarized in San Juan County, 2011, pp. 58-60) and is not reflective of best available science. ... As an example, two studies by Barsh et al. are cited throughout the Best Available Science Synthesis document (San Juan County, 2011) as providing evidence of chemical contamination (e.g., pesticides, surfactants) in San Juan County surface waters (Barsh et al., 2008) and a localized freshwater fish population (Barsh et al., 2010). It is my opinion that both studies are of limited value and should not be used to infer the presence of ecological risks. Both studies rely on commercial kits to analyze chemical concentrations. While these kits are useful screening tools and may inform the need for further study, they are no substitute for properly conducted monitoring studies using standard analytical methodologies, nor for relying on regulatory field sampling protocols (including appropriate data quality controls, such as field replicates, field blanks, matrix spikes, etc.). Today, there is a very relevant article in the Seattle Times about Hood Canal and our old friend nitrogen. For those of you following the CAOs, you'll remember that Dr. Adamus and Shireene Hale have used the prospect of nitrogen pollution to make the case that our buffers should be much bigger. Over the past many years, it had become accepted wisdom that fish kills and related problems in Hood Canal were caused by humans, especially human waste coming from septic systems. However, a new comprehensive review of the science dispels that idea as a myth. It has lessons for us here in the San Juans about jumping to the "blame the people" conclusion, especially since it turns out to be wrong for poorly-circulated Hood Canal with 60,000 people, whereas we are fewer than 16,000 people living within the very well-circulated Straits of Georgia. But in 2002, 2003, 2004, 2006 and 2010, periods of low oxygen were so extreme that fish died in massive numbers. In most of those years, thousands of fish from more than two dozen species were killed. Underwater photographs captured wolf eels seeming to pant and rockfish by the hundreds gathering near the water's surface, where oxygen was more plentiful. Dead lingcod washed ashore. While no one formally tracked fish kills through history, the events of the last decade unnerved many scientists. Fish kills have hammered Hood Canal off and on at least as far back as the 1920s, if not earlier. A 2008 study of core samples found that oxygen levels in much of the canal were actually lower before 1900 than they were for most of the 20th century. When several studies, including by both Newton and Brett, showed significant nutrient loading from human waste found its way to Hood Canal, that seemed to offer an explanation. But there was debate about scale. Even though hundreds of tons of nutrients washed into the canal, that remained a fraction of the nitrogen coming from natural sources. The chief question remained: Were human sources enough to push the system over the edge? "The biggest source is the Pacific Ocean," said Mindy Roberts, who led the new review for Ecology. But in Lynch Cove, in particular, "some evidence is showing humans are contributing. Other evidence is saying no." The two watchdog agencies — along with an exhaustive review by outside experts — concluded that human sources of nitrogen contributing to low-oxygen events in the mainstem of Hood Canal were "insignificant," while evidence linking humans to oxygen problems in the more troubled area near the canal's end in Lynch Cove "is not strong." The overwhelming causes of fish kills, the agencies concluded, are the geography of the canal and ocean conditions. Aside from being scientifically unsupportable; aside from forcing on us a draconian planning vision that is mismatched for our community; aside from being hopelessly impractical, the CAOs are wrong because they reinforce the stereotypes of self-hating environmentalism. Watch this clip from Santa Cruz, California of an interview conducted during this year's Earth Day "celebration." Santa Cruz, by the way, is where Janet Alderton of the Friends picked up a graduate degree. Maybe the young lady in the video will be running the Friends in 15 years ... or be on our Planning Commission ... or even be a Council member. She's got a bright future as a planner too, and has a lot in common with all those consultants we've hired. Better yet, she could work for the Department of Ecology. I pledge allegiance to the plan of the American Planning Association, and to Ecology's agenda, for which it stands, one vision, under consensus, sustainable, with Smartgrowth code enforcement for all. We might as well have our Council say that revised pledge of allegiance at the beginning of each Council session. The CAOs have more to do with pushing a particular planning vision of America than they do with solving environmental problems here. As if we were all stamped out of the same sheet of metal, an army of forward-deployed planners, reinforced by Ecology muscle, pushes a standard formula of pre-positioned Best Available Science (BAS) onto vastly different locales to mass produce communities of life-like sameness. It doesn't matter whether their "solutions" make any sense for a particular community. It doesn't matter if there isn't really any problem to be "solved." What matters is that every community end up the same -- with the same rules, look, and feel as every other community. Restriction, conformity, and uniformity squeeze the individuality and vitality out of us. All the levers of power; all community attitudes; all local laws fit a modular system that plugs us into a larger apparatus making us more efficiently governable. After each community has been put through the CAO play-doh extruder, we all come out with a standardized CAO look, so the pre-prepared and now time-tested legal precedents of the Growth Management Hearings Boards can be applied like blasé administrative rulings, without any need to expend effort to fend off new legal challenges to basic rights argued from first-principles. We're widgets on an assembly line, pounded into shape by forces from the outside while eco-insiders and planners have eaten away at us from the inside. Upton Sinclair was a great, if flawed, American. The foremost muckracker of his day, he revealed the social ills of factory mass production to the general public. These days we mass produce community sameness using planning principles and eco-hysteria, which creates its own social ills. I wonder if Sinclair would herald the modern ills of social mass production? Somehow I think not because Upton Sinclair also was a prominent socialist. Nevertheless, Sinclair's words about socialism's tactics may yet offer us succor for the warning they provide us today. I don't agree with Sinclair about "the Big Lie," but I do agree that, as a nation, we have been successful at defeating the frontal attacks of socialism. Unfortunately, I also believe we've been out-flanked by the planners and eco-insiders of today. Theirs is an EPIC story. Marginalize all opposition. Confuse by using soft-sounding, technical jargon. Don't talk about negative consequences. Rely on poor-quality, incomplete, and cherry-picked science. Then wash it all down with a heavy dose of consensus. That's how you get a plan approved, and planning is everything to gang green. Committee members should represent a cross section of interest groups and public values. However, all committee members should have experience in working toward consensus. “Radicals” or “extremists” who cannot work in a group setting should be passed over for individuals with similar values who can develop constructive solutions to satisfy opposing interests. The rest of the paper essentially talks about how to manipulate both the committee and the public at large. Using these rules, our County constituted a Technical Advisory Committee for our Shoreline Management Update, so those rules are at work here in our County. Given the heightened scrutiny of planners by some members of the public, what is said -- or not said -- is especially important in building support for planning. "Building support for planning?" Shows you where their heads are. Committees and plans have literally taken over our lives instead of commerce, free association, and environmental protection. Committees and plans are the weapons of choice of gang green, or maybe it's better to say that it's their habitat. When we create more committees and more planning initiatives, we are undoing ourselves (and doing nothing for the environment either). The further we go down this path, the worse it will get. We will literally be planned out of existence by the insiders, with no benefit to the environment. I was educated by Keynesians, so whenever the mention of Milton Friedman comes up, I have to admit that I bristle a bit, but I cannot think of a better example of the differences between planning and free enterprise than the short video below. Bravo Milton Friedman! We have completely lost sight of the fact that planning is not necessary to achieve desirable outcomes. Watch the video and compare the power of the pencil to the power of planning. Assuming we even need more environmental protection here in the islands (and there isn't much evidence of that), then ask yourself, "If free enterprise can produce a pencil (or a car), why can't it produce a clean environment." The truth is that it can, and if we need more environmental protection, we'd be a lot better off if we got rid of the rigged system of planners, bureaucrats, and profit-maximizing non-profits. Have you ever wondered why the Land Bank and our County are facing high debt and financial hard times, but the Friends of the San Juans are flush with cash? The County has come out with a new website to help us understand the facts. The trouble is that it should be called the "half-truth" checker. The current post has to do with the Consignment Treasures situation described in the previous post, and that story dovetails to the CAOs. It illustrates how easily a property can end up in planning purgatory even when the County "didn't do anything." The right to continue a nonconforming use despite a zoning ordinance that prohibits that use in that zone is sometimes referred to as a vested right. Rhod-A-Zalea v. Snohomish County, 136 Wn.2d 1, 6 (1998). Though, this right in the context of a nonconforming use refers only to the right not to have the use immediately terminated in the face of a zoning ordinance that prohibits it. Id. "The right not to have the use immediately terminated." That's what it says, and that's not exactly "live long and prosper." As the linked case shows, it may not immediately terminate the use, but it sets it up for termination down the road. Furthermore, no matter how "non-conforming" may be intended by the County, it is frequently interpreted by banks and insurance companies to mean that future operations are in doubt. Just try to get financing for continued or expanded operations when the banks think your future is in doubt. This is how the County can be both technically correct and deceptive at the same time. In addition, some of the content on the fact checker may not even be technically correct. For instance, it says that "the Council ... has formally encouraged Consignment Treasures to apply to be declared an Essential Public Facility." Penwell, on the other hand, says that he's had no direct word from the Council on this matter. Also, Penwell says that his attorneys had provided wording and suggestions so that the non-conforming designation would not have been necessary. Apparently, no one in the County explored the Penwell alternative proposals. What does any of this have to do with the CAOs? Plenty. Many of us will face the prospect of non-conforming designations as a result of the CAOs. With that will come multitudes of stories similar to the developing story about Consignment Treasures. Namely, the County will be able to say that they haven't really done anything to us, but we will still be hobbled. That's planning purgatory. That's the future for many of us under the CAOs. This post serves as a segue from a series-within-a-series about environmental organizations to one about community dynamics in general. The Friends and their friends believe in rules, and once a rule is established, they are very good at convincing people that the rule is the most important thing, not the reason why the rule was established or any potentially mitigating factors. For instance, one of the rules being discussed for the CAOs is whether buffers cover developed areas and how non-conformity works in that instance. Some argue that if buffers are allowed to include developed areas then any change to that developed area is a potential increase in non-conformity. Any expansion of a house, even upwards with no change of footprint, would represent an expansion of non-conformity. But that really doesn't address whether such an activity (building upward) has any effect on the functions and values of the critical area, does it? It seems like administration of the rule has become more important than the substance or intent of the law. When you combine oppressive and/or unclear rules with a local government that is not trusted, you get the situation we have today in San Juan County. Many people here believe the CAOs will be used, not to protect the environment, but to settle scores. In keeping with past experiences, some people (or kinds of people) will be targeted and others won't. We saw this with Charles Dalton, for example. And many people feel we are seeing this happening again with Consignment Treasures on San Juan Island. While not directly related to the CAOs, the dynamics surrounding the Consignment Treasures controversy are much the same. It involves the intersection of environmental (recycling) and land use issues to name just one similarity, but there are more. If you haven't been following the situation, the brief summary is that the County has voted to make Consignment Treasures non-conforming at its current location and suggested it become an Essential Public Facility. Alternatively, some Councilors have suggested that Consignment Treasures close its current location and move to Sutton Road, where it will be on County land. Lined up on one side are the community censors and defenders of rules, such as Sharon Kivisto of sanjuanislander.com. She always appears to defend rules and taxes, except when the Friends are involved. Kivisto admits to censoring letters to the editor, and she justifies it by saying that she won't print libel or slander. Someone should inform her that no one prints slander because, by definition, slander is verbal. Kivisto, as usual, is on the same side as the County. County staff, particularly Ed Hale (whose wife is Shireene Hale of Planning), have virtually made a career out of perennially expressing displeasure with Consignment Treasures. And overlaid on top of that, we have politics. Many of our leading local Democrats like to equate party membership to local environmental support, which leads to an effort to turn every environmental debate into a political maelstrom. The environment, however, isn't a true political divide. I know many environmentally-conscious Democrats in this county who feel ostracized by their own party at the local level because they dissent from it on local environmental issues, especially issues surrounding the Friends, the Scenic Byway, the National Monument, land use planning, and property rights. However, many of the leading vocal Democrats in this county view these issues as purity tests for the Democratic masses. If you're not with them on those issues, you're a Republican. Big mistake. Nevertheless, politics brings us to the other side because the founder of Consignment Treasures, Frank Penwell, has been a thorn in the side of the eco-pure Democrats. Penwell has done a lot of good for our community, but he is most well known for being an advocate for property rights and opposing environmentalists. He's been Head of the San Juan Grange and opposed the takeover of that venerable institution by local eco-activists who wanted to use it for their own purposes. He's the head of the local chapter of CAPR, the Citizens Alliance for Property Rights. The pure Democrats despise CAPR and have said some pretty nasty things about Penwell over the years. One eco-pure Democrat and devoutly religious member of our Council, who Penwell opposed during the Grange controversy, memorably said to him after church one day, "You destroy everything you touch." This was said to a man who has used his own money (not a grant in sight) to found a community recycling and reuse center that now donates thousands of dollars to charity and for scholarships. That's more than the Friends have ever done, and yet, Penwell is evil and the Friends are saints. Penwell's style may not be everyone's cup of tea, but he produces a lot of good substance. Judge not, lest ye be judged. So it is against this backdrop that the Consignment Treasures controversy plays out. When some of Penwell's long-time opponents say "all we're trying to do" is ensure Consignment Treasures can continue to be successful, no one believes them. They might as well say, "I'm from the government, and I'm here to help." No one believes that placing Consignment Treasures under greater County control (either via non-conforming status or by moving operations to Sutton Road) is an innocent move. We believe it's score settling using rules. People love Consignment Treasures, which is why its Facebook page had over 800 followers within just a few days. Because of context, many see the County moves as ultimately malevolent, just as they view the intent behind the CAOs as malevolent. There was a brief pause in the countdown as I caught up on some accumulated non-TH obligations. An interesting headline appeared today that fits our series-within-a-series theme related to "environmental organizations." We've been talking about how environmental organizations are out-of-step with people. That's not surprising, considering that many environmental organizations portray humanity as an infestation needing extermination. Today we received news that "People for Puget Sound" is closing its doors. It seems that times are hard for everyone, including the eco-activists. I think it's more than just a sign of the economic times, though. 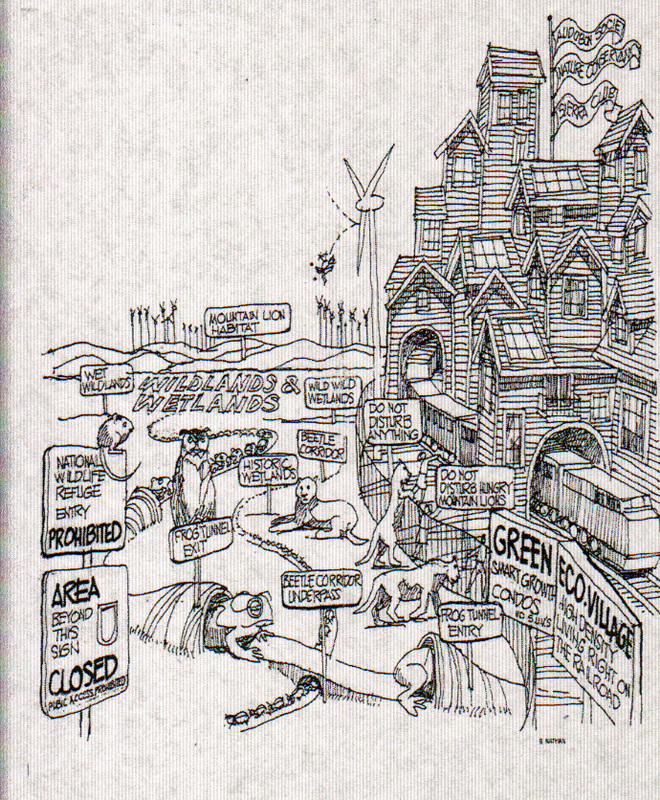 For 20 years or more, the trendiest green ideas related to land use have sought to push people into cities and keep them out of the country. It has become harder and harder to live in rural areas. As you sow, so shall you reap. As fewer and fewer of our population live in the country, fewer will have country values; fewer will have an intimate relationship with nature; fewer will want to protect it. An increasing disregard for nature is showing up in the data. In the end, the strategy hatched to save the environment will threaten it, since the greatest protectors of nature are the people who have contact with it; who live and work in it. Persecution of country people, in the end, will lead to persecution of the environment. People for Puget Sound ... rest in peace. A massive blind-spot associated with the CAOs, and with traditional environmentalism generally, is their denial that human-altered ecosystems have any function or value. We live during a time where every part of the earth has been altered by humans. That's why some have started to call this era the Anthropocene. Moreover, we should realize that the "untouched pristine" habitats that were encountered in the New World at the time of European contact were, in fact, highly altered by Native Americans and their predecessors for thousands of years. None of us have ever lived in a totally pristine environment. No such thing has existed for a long, long time. And that is the subject of a book by Emma Marris, a writer for the journal Nature. Marris' book is called "Rambunctious Garden" where she describes the paradigm shift roiling the environmental world. For decades people have unquestioningly accepted the idea that our goal is to preserve nature in its pristine, pre-human state. But many scientists have come to see this as an outdated dream that thwarts bold new plans to save the environment and prevents us from having a fuller relationship with nature. Humans have changed the landscapes they inhabit since prehistory, and climate change means even the remotest places now bear the fingerprints of humanity. Emma Marris argues convincingly that it is time to look forward and create the “rambunctious garden,” a hybrid of wild nature and human management. The CAOs are out of step with these new thoughts about ecosystems (like permaculture too), and they are devoid of any recognition of the function and value of a rambunctious world. What if Lockheed Martin had sold weapons systems to both the Russians and the Americans during the Cold War? They wouldn't have been very invested in the peace process, would they? That's not very different from the position of many environmental groups who seem to make money from all sides when it comes to prospective eco-catastrophes. Environmental groups get grants and contributions to study the "catastrophe," and they get funding to coordinate "solutions" too. And there seems to be no end to the circle game. Many people think the listings above are "conspiracies." I don't think so. I think they are worse than conspiracies. They are full-fledged state-funded economic programs based on process and control ... of us ... and it's all fueled by the thought of eco-catastrophe. Even if there were catastrophe headed our way, there's no guarantee that un-democratic "solutions" would do anything but earn money for those in control while the rest of us twirl down the drain. The Friends and their friends herald catastrophe at every turn. If there are any data suggestive of a potential problem, they exaggerate it. If there are no data, they assume a grand unseen threat. If the data show a healthy ecosystem, they proclaim the ecosystem to be fragile. No matter what the data say, they promote the specter of fragility, threat, overpopulation, and collapse. That drives in the contributions and grants like mad, especially from the nature woo crowd. Grabs headlines too. It also shores up advocacy for the steamrolling of more and more land use (and water) controls, which just hands the Friends more tools to bully and sue, finds more "problems," reinforces their image as ecological saviors, and brings in more grants and contributions. It's never ending, and the Friends and their friends have no interest in peaceful coexistence between nature and people. It would be bad for business. Catastrophe and the ultimate solution of driving people away from the islands are very profitable. It's not as if the Friends are economically connected to the local community anyway, not as much as they're connected to other environmental groups, the tribes, grant-making institutions, and off-island (eco-tourist) contributors who buy into the destination marketing image of the San Juans as a threatened natural paradise. Why should the Friends care if they destroy our home while pretending to save it? Promote the phony fix for the phony catastrophe; laugh all the way to the real bank and to the real "we all got together and gave ourselves awards for saving the planet" ceremony. That's the Friends. It's a win-win for them and a lose-lose for everyone not in their "money ecosystem." The CAOs are part of the faux-dependent Eco-Arms Race that makes winners of the Friends and their friends and leaves the rest of us with nowhere to hide.